Not quite a picture a day, no. 10: Desem bread | Makiko Itoh : Not a nameless cat. I am still drawing...but I haven't been able to keep up the daily picture goal. There are a couple of reasons for this; first, I've just not had the time, or given it the time, on days when I've been swamped with work and other matter. Second, I've discovered that quick sketches don't satisfy me as much as trying to do a fairly detailed, finished drawing. that takes quite a lot of time. 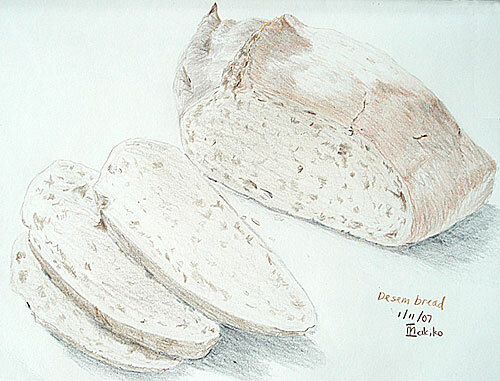 The picture here of desem bread took about 4 hours, and that's one of the shorter times. There's a picture I'm still working on, of 5 tiny pastries, which so far has taken about 10 hours - for one pastry. I guess for the moment this is the style I like. One reason for this exercise was to re-discover what my style is, so in that sense I guess this is a good thing so far. The other, quite annoying reason is that I can't seem to figure out how to either scan or photograph the drawings well enough. The scanner seems to have suddenly lost the ability to scan the green/blue colors (maybe it's broken...it is an old scanner) and my skills at photographing the pictures is not too good. I'm still working on this..we recently set up some daylight lamps for a small studio set up, and I need to get more used to this. I have some pictures completed and still unscanned/unphotographed, which should show up here shortly.